Thunderbolt 3 brings data transfers at speeds up to 40Gbps over USB-C, enabling a superset of standard USB-C to truly enable one compact port that does it all - delivering the fastest, most versatile connection to any dock, display, or data device. For the first time, one port can connect numerous Thunderbolt devices, any display, and billions of USB devices (additional adapters may be required). The cable is electronically marked (e-marker) with an IC to assist in negotiation of charging rates and Alternate Modes. Supports USB-IF Power Delivery standard (up to 3A, 5V-20V, 60W max) and data transfer up to 40Gbps between Thunderbolt 3 hosts and devices, 10Gbps for USB-C 3.1 Gen 2 hosts and devices. Thunderbolt 3 supports dual 4096x2160@60Hz (4K) or single 5120x2880@60Hz (5K) video output, USB-C 3.1 Gen 2 support for Alternate Modes, including VESA DisplayPort Alt Mode. Thunderbolt 3 peer-to-peer 10Gbit networking is also supported for blazing fast data transfers from one Thunderbolt 3 system to another. 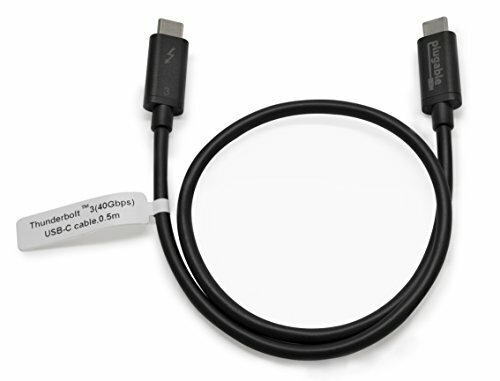 Cable supports Thunderbolt 3 40Gbps and all USB generations; USB 1.1, 2.0, 3.0 and USB 3.1 Gen 1/Gen 2 over USB Type-C.
Incompatible with Qualcomm QC and other (non USB-IF PD) "Power Delivery" technologies. Thunderbolt 3 40Gbps Type-C to Type-C Cable is Thunderbolt, USB & DisplayPort Alt Mode compatible. Works great with your Thunderbolt 3 Apple Mac (MacBook Pro Late 2016/2017/2018 & iMac 2017) and Windows PC.